1. Put the avocados in the small bowl of a food processor with the garlic and lime juice; season and whizz until smooth. Use a mug or large glass as a template to cut out 12 rounds from the tortillas. Put the oil in a large frying pan and set over a low-medium heat. Gently fry the tortilla rounds in a single layer, in batches if needed, cooking for 1-2 minutes on each side, until golden. Drain on kitchen paper. 2. 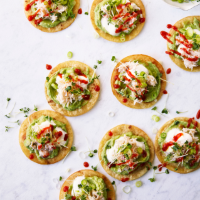 Spread a heaped tsp avocado purée on each crisp tortilla and top with a little soured cream, crab, salad onion and cress. Drizzle over some hot sauce to finish.